1 Place the water and 1 Knorr Chicken Stock Cube in a saucepan and bring to the boil. Add the rice, stir once, and return to the boil, then turn the heat down and follow cooking times on pack. 2 Heat the oil in a wok and stir-fry the onion, red pepper, green pepper, chilli pepper and crushed garlic for 2-3 minutes. Now add the paprika and stir-fry for 2 minutes. 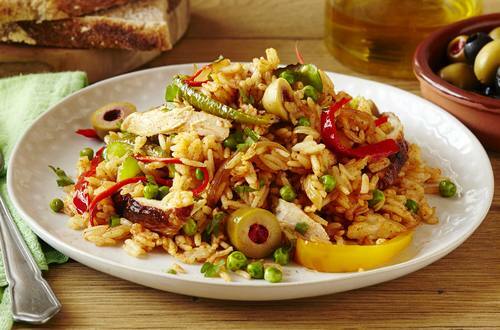 3 Add the cooked rice, frozen peas and olives (if using) and stir in gently. Add 60ml water and 1 crumbled Knorr Chicken Stock Cube and bring the heat up until water is hot. 4 Add the shredded chicken and stir the chicken in with the rice. Reduce heat and simmer until extra water is absorbed by rice. It’s ok for the rice to get quite soft in this dish. Season with a sprinkle of Knorr Aromat Seasoning.